Presente | Help shift the media debate on the humanitarian crisis at the border! The news media are utterly failing in their responsibility to tell the heartbreaking truth of what's happening at the border. It gets worse. By using militaristic language to report the crisis — for instance, describing the migration as a "surge" and the children — as detainees, as though they belong in Guantanamo Bay instead of in their families' loving arms. The children are surviving a horrendous experience: crammed in detention centers like dogs in a kennel while allegations of sexual abuse are surfacing. Meanwhile, the Obama administration's response to the crisis has been to speed up deportations and the Republicans are getting away with suggesting hysterical solutions like deploying the National Guard to an already militarized border. We need to get our message in the media if we want to win in the court of public opinion and shift the debate from increased deportations to protection and asylum. This is a humanitarian crisis and should be treated as such. Children and families should be offered protections and asylum, not thrown into deportations that would send them back into violence and poverty. The children are fleeing rampant gang violence, extreme poverty, and in many cases, death threats against their very own lives. Many of these children actually qualify for asylum but will not be able obtain it unless they have good legal representation. 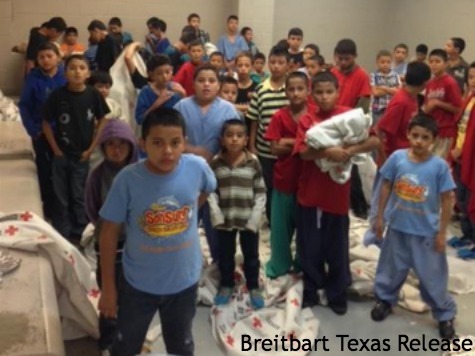 We have a moral responsibility to treat these children humanely and provide them with fair legal assistance, immediate care, and reunify them with their parents that are already in the U.S.
Republicans suggesting hysterical solutions like deploying the National Guard to an already militarized border will not solve anything — the children will keep coming and it will only add fuel to the fire in an already volatile situation. It's unacceptable that the Obama administration's response to the crisis has been to increase deportations and call for building more detention centers. Meanwhile prominent figures like Presidential hopeful Hillary Clinton urging to "send them back!" begs the questions "send them back to what?" To their death at the hands of the violence in their countries? What about those that have parents already living the U.S.? The dystopian living conditions that many migrant families face in their Central American countries are conditions that U.S. foreign and economic policy helped to create. The Obama administration and future presidential administrations must recognize the socioeconomics behind the child migrant crisis. We have a moral obligation to treat these minors humanely. - Letters should be under 250 words. If your letter is any longer, it will likely be edited or not printed. - Stay focused on one (or, at the most, two) main point(s). - Get to the main point in the first two sentences. - If possible, include interesting facts, relevant personal experience, and any local connections to the issue. - Put the issue in your own words. If editors get the sense that they're getting a form letter or commonly repeated language, they won't publish your letter.